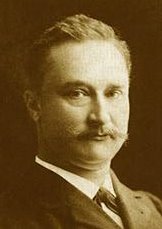 Eugene Dubois (Jan. 28, 1858-Dec. 16, 1940) joined the Dutch Army as a medical officer, and used spare time from his medical duties to search for fossils, first in Sumatra and then in Java. He searched on the banks of the Solo River, with two assigned engineers and a crew of convict labourers to help him. In September 1890, his workers found a human, or human-like, fossil at Koedoeng Broeboes. This consisted of the right side of the chin of a lower jaw and three attached teeth. In August 1891 he found a primate molar tooth. Two months later and one meter away was found an intact skullcap, the fossil which would be known as Java Man. In August 1892, a third primate fossil, an almost complete left thigh bone, was found between 10 and 15 meters away from the skullcap. In 1894 Dubois published a description of his fossils, naming them Pithecanthropus erectus (now Home erectus), describing it as neither ape nor human, but something intermediate. In 1895 he returned to Europe to promote the fossil and his interpretation. A few scientists enthusiastically endorsed Dubois' work, but most disagreed with his interpretation. Many scientists pointed out similarities between the Java Man skullcap and Neandertal fossils. Around 1900 Dubois ceased to discuss Java Man, and hid the fossils in his home while he moved on to other research topics. geology and paleontology. It was not until 1923 that Dubois, under pressure from scientists, once again allowed access to the Java Man fossils. That and the discovery of similar fossils caused it to once again become a topic of debate. 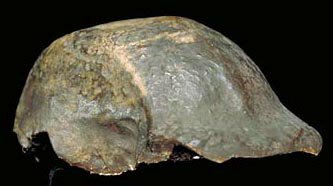 Skull cap (Trinil 2, holotype of Home erectus) from HERE.